To celebrate our 1st anniversary as husband and wife, we decide to go for a spontaneous trip! So, we waited for Singapore Airline Spontaneous Promotion in July and see where are the places we can go for a short trip. In the end, we choose China - Shanghai because it is on the list and the last time we visited China was 3 years ago? As we have visited Hangzhou, Suzhou and Shanghai in our last trip, we have decided to visit Ningbo and Shaoxing this time! First stop was Ningbo. Well, Why Ningbo? Of all the places, why choose Ningbo? Even the Chinese don’t visit Ningbo during their holiday. So, when friends heard we were visiting Ningbo, they were puzzled. We choose Ningbo because we wanted to find a nice resort to chill and less crowd. We love China but without the crowd. Plus, we have not been to Ningbo and a friend of my told me that Ningbo has lots of good food! Thus, we stayed at Ningbo for 2 night and the stay was the best throughout the trip! After the 2 hours of HSR ride, we arrived at Ningbo station and took private car hire - Didi to the resort. And of course, the resort is amazing! We wouldn’t want to go anywhere else other than staying in the resort. So, we end up having our dinner in the Hotel’s restaurant and the bar. There are not much dinner option for us to choose when we stay in Park Hyatt Ningbo. So, we ended up at Seafood House Restaurant. 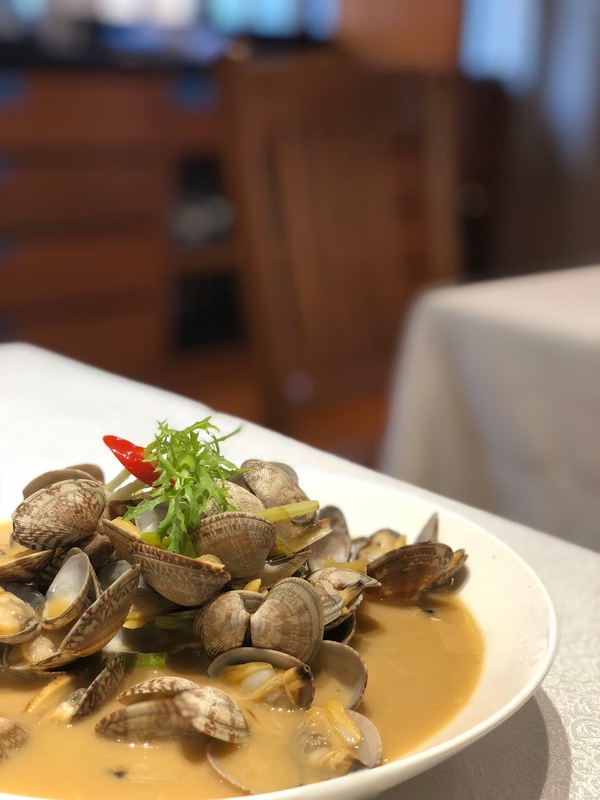 As H is not a fan of seafood and the menu price is extortion, we decide to skip the seafood items on the menu and go for the traditional dish. The wok-fried rice cake, eggplant, minced pork took me by surprise. The rice cake is very tender yet chewy. Probably the best rice cake I had. Plus, it goes really well with the eggplant and minced pork! We ordered the wok-fried pork rib, “zhenjiang” style but it was too sweet for us. Lastly, we had wok-fried noodle with shrimps ,”zhenjiang” style to go with the vegetables and pork we had. 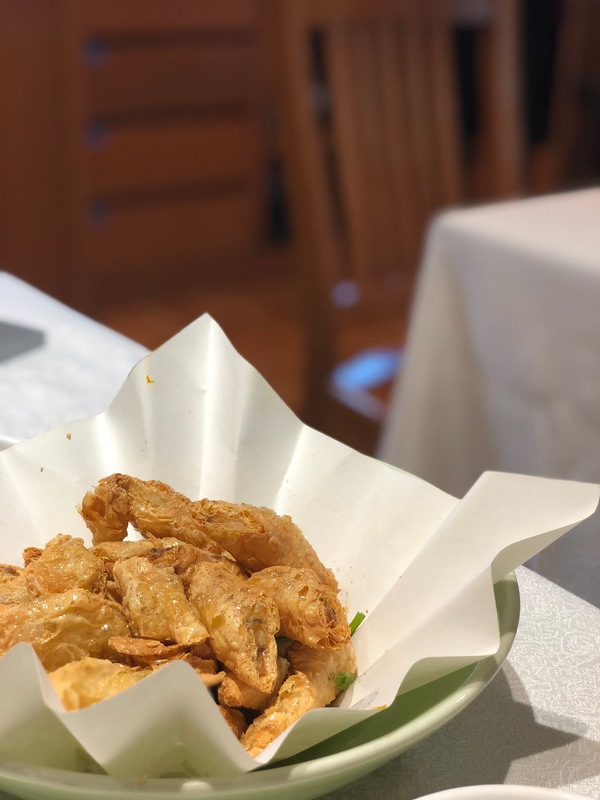 It was my first Zhenjiang meal and it did not disappoint at all. Unlike other Chinese cooking style I had in my previous trip that were too oily or salty, Zhenjiang style food is well balanced! Dinner: 5:00 - 9:30 p.m.
After dinner, we visited the Red bar for some drinks and was surprise to find ourselves and 2 other table that night. The Red Bar used to be a temple and now has revamp into a contemporary bar. The bar serves cocktails and champagne as well as fingers food. In addition, there are opera singers performing at night. On the second morning, we took a morning dip in the pool overlooking the lake. The infinity pool is gorgeous! & I love how the place is quiet and peaceful! Then, we took the Shuttle service the hotel provides and visited Gang Ya Gou for Brunch! Ningbo is famous for its rice ball aka Tangyuan and Gang Ya Gou has been in the business for many years. As I am not a fan of Tang yuan so I wasn’t expecting much. But this place is so good that we visited the same place second time because I didn’t get enough of Tang Yuan. Other than the Tang yuan, i feel that the rest of the dishes are mediocre. After lunch, we walk around Tian Yi Square. Tian Yi square is the downtown of Ningbo and you can find many international shops there. It was scorching hot so we went to the check out the mall and see what’s in there! The square is also one of the biggest multi-function square in China because there are around 300 shops in the square. We visited the supermarket and even spend an hour at the apple store to learn about photo editing! After spending sometime at Tian yi Square, we visited the Drum tower. 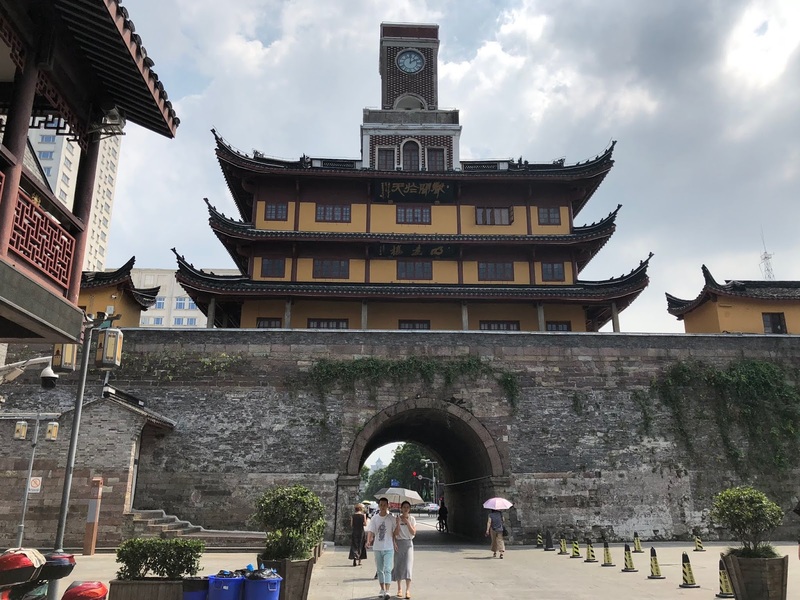 The drum tower was built 1100 years ago and is one of the iconic symbols of Ningbo. There are many small shops operating in the street but only one caught our attention – 矮子餡餅。Everybody that visited the shop left with 2 o 3 plastic bag filled with 4-5 box in each. It is so good and affordable! We bought 1 packet which consist of 10 pieces. You can choose different flavour and for 10 RMB! You can keep the biscuit for up to 1week. Unfortunately. we were just at the start of our trip and cannot bring them back for our family and friends! Tian Yi Ge also known as Tian Yi Pavilion is the most popular library and garden in Ningbo. IT was founded by Fan Qin and has up to a collection of 70,000 volumes of books. Even though with the great collection of book, they were never open to public. The library is locked up and only the descendent of Fan Qin are allowed to visit. When Fan Qin passed on, his eldest son Fan Da Cong inherited the library and continue the legacy of his dad. “代不分书，书不出阁” The books must stay together and it cannot be divided among the descendant. Also, the books shall not leave the library. Only a few famous scholar manage to visit the library after many years. Unfortunately, during the war, many books were burnt and destroyed. We spend the late afternoon exploring the biggest private library during the ancient time and was amazed by the passion and devotion the book collector has. Even the layout of the Pavilion was designed to prevent fire. Such as using Clay to Wrap wood structures, pool outside the library as well as installing fire doors. There are a few 贴阁碧 restaurants in Ningbo and we visited the one in Nan Tang Lao Jie. Recommended by one of the didi driver, the restaurants offers pretty good and authentic Local Ningbo cuisine. I love the rice cake! It’s so good! We order a few dish to share and every dish is so good! Especially the seafood! Very fresh and yummy! Unfortunately, H don’t eat crab so we didn’t order the steam crab. Ningbo government has refurbished the old street to a tourist street in Ningbo. The buildings and architecture has been constructed to the traditional street style. There are old stone bridges and river as well as a few historic mansions located in the area. There street is really long and we took about 40 – 60 minutes to finish. There are many restaurants and street food available and we had our dinner at 贴阁碧 as well as snacking on the street food. On our last day in Ningbo, we rented a bicycle from the hotel and cycled around Dong Qian Lake. Dong Qian Lake, also known as one of the largest freshwater lake is beautiful and quiet. We took a relaxing morning ride around the lake and it was amazing! Honestly, where can you still find such peace in China? After the morning ride, we enjoy the last bit of luxury in Park Hyatt before embarking to the next adventure in Shao xing.